When General Gene Fischer took over as 1st Tactical Fighter Wing commander at Langley Air Force Base in Virginia in 1982 and as commander of Nellis Air Force Base a year later, they were not performing at peak efficiency. When Fischer left Langley for the Las Vegas job, his successor accepted an award for outstanding operational readiness that Fischer's leadership had earned. When Fischer left Nellis for a high-level Pentagon job in 1985, his successor accepted the President's Award for Installation Excellence -- another honor brought about by Fischer's leadership. 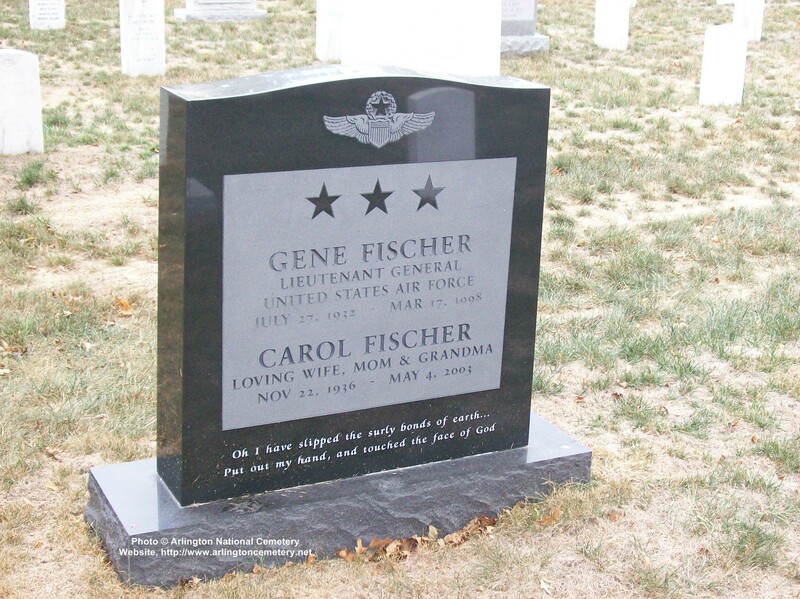 Though not always there to take the bows, Fischer left an indelible mark in many places where he served during a 42-year career in the National Guard and Air Force. Lieutenant General Eugene H. Fischer, who as Nellis' 28th commander oversaw the first operational exercises of the then-top secret F-117 Stealth fighter, has died. He was 65. 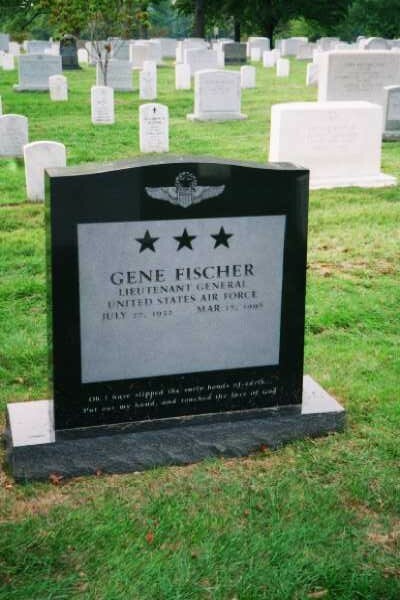 Fischer, a resident of Piney Flats, Tennessee., died March 17, 1998 in Boise, Idaho, while visiting his son, Lieuteant Colonel Mike Fischer, who is stationed at Mountain Home AFB. The cause of death was complications from leukemia, his family said. Interment services with full military honors will be Wednesday at Arlington National Cemetery. "Gene cleaned up things at Nellis and greatly improved the professionalism there," retired four-star Air Force General Bill Creech of Henderson said Monday about Fischer, who served directly under him in the 1980s. "He was good at analyzing problems and was firm but fair in dealing with them. I would say that if Gene hadn't started so late (in the Air Force) he would have earned a fourth star." At age 19, Fischer entered the Illinois Air National Guard and learned to fly the P-51 Mustang, a World War II fighter. His unit was activated during the Berlin crisis. In 1962, he accepted an offer to enter the Air Force as a Captain. He retired as a three-star general in 1993. A command pilot with more than 5,500 flying hours, Fischer flew 200 combat missions over Laos and Vietnam. "My father said his assignments at Langley and Nellis were his favorites because he accomplished so much (in a short time)," Mike Fischer said. "He was a likable man who took a genuine interest in the people he met." Another of Fischer's sons, Mark Fischer, is an Air Force major in Goldsboro, North Carolina. affairs from George Washington University. During his military career, Fischer flew everything from propeller planes to the F-15 jet and served at air bases in Florida, California, Vietnam, Korea and Panama. He graduated from the Naval War College in 1970 and the Air War College in 1974. Fischer came to Nellis as a brigadier general (one star) in May 1983 and left as a major general (two stars) in October 1985 to become assistant deputy chief of staff and operations at Air Force headquarters in the Pentagon. He earned his third star on August 2, 1991. At Nellis, it was Fischer's job to jealously guard the military's biggest secret -- the Stealth fighter, a plane that cannot be detected by radar. It was used effectively in the Persian Gulf War. "My father was a man of absolute integrity," Mike Fischer said of his dad's ability to keep such a big secret, even from his wife, Carol, his high school sweetheart who he married on Easter Sunday 1956. "He said a man can only give away his integrity -- it cannot be taken away." Creech agreed: "It was a tribute to Gene and others who worked on the Stealth that it was kept secret for 5 1/2 years." Fischer's decorations included the Defense Distinguished Service Medal, Legion of Merit with oak leaf cluster, the Distinguished Flying Cross and the Bronze Star. Four years ago, he retired to Piney Flats where he was a member of several civic groups including the Rotary Club and Shriners. In addition to his wife and two sons, Fischer is survived by another son, Eric Fischer of Tucson, Ariz.; a daughter, Mindy Elizabeth Wade, of Savannah, Ga.; and five grandchildren. Lieutenant General Eugene H. Fischer was the Inspector General, Headquarters U.S. Air Force, Washington, D.C. He heads the Air Force inspection, investigative, counterintelligence and complaint programs. Also, he was responsible for the evaluation of Air Force operational readiness. General Fischer was born in Pekin, Illinois. He earned a bachelor of science degree in business administration from Bradley University and a master of science degree in international affairs from The George Washington University. The general graduated from the Naval War College Command and Staff Course in 1970, and the Air War College in 1974. He enlisted in the U.S. Air Force as an aviation cadet, completing primary pilot training at Malden Air Force Base, Missouri, and basic pilot training at Williams Air Force Base, Arizona, and Laughlin Air Force Base, Texas. After completing F-84 combat crew training at Luke Air Force Base, Arizona, he was assigned to the Illinois Air National Guard's 169th Tactical Fighter Squadron, where he flew the F-51 and F-84F. He was assigned to the 558th Tactical Fighter Squadron, 12th Tactical Fighter Wing, MacDill Air Force Base, Florida, in August 1962, and flew the F-84F until December 1963, when the wing became the first operational unit to transition to F-4Cs. In April 1965 he moved with the squadron to Naha Air Base, Okinawa, for rotational support of the 51st Fighter-Interceptor Wing. The general returned with the 558th Tactical Fighter Squadron to MacDill in June 1965. In November 1965 he deployed with the 12th Tactical Fighter Wing to Cam Ranh Bay Air Base, South Vietnam. General Fischer returned to the United States in October 1966 and became an F-4 instructor pilot with the 431st Tactical Fighter Squadron, 479th Tactical Fighter Wing, George Air Force Base, California. Upon graduation from the Naval War College in June 1970, he was assigned to Headquarters Tactical Air Command, Langley Air Force Base, Virginia, as an operations staff officer, Office of the Deputy Chief of Staff for Plans. In July 1972 he transferred to the 1st Tactical Fighter Wing, MacDill Air Force Base, and served as chief of standardization and evaluation. He took command of the 4501st Tactical Fighter Squadron there in August 1972. The general completed Air War College in June 1974 and was assigned as vice commander of the 51st Air Base Wing, Osan Air Base, South Korea. While he was there, the wing was reorganized into the 51st Composite Wing (Tactical) and equipped with F-4Es and OV-10s. General Fischer was assigned as deputy commander for operations in the newly organized tactical wing. In July 1975 he was named chief of the Readiness Branch in the Directorate of Operations, Organization of the Joint Chiefs of Staff, Washington, D.C. In December 1977 he transferred to Homestead Air Force Base, Florida, as the 31st Tactical Fighter Wing's deputy commander for operations. General Fischer became the wing's vice commander in August 1979 and took command in January 1980. He returned to Langley Air Force Base in January 1982 as commander of the F-15-equipped 1st Tactical Fighter Wing. The general served as commander of the U.S. Air Force Tactical Fighter Weapons Center, Nellis Air Force Base, Nevada, from May 1983 to October 1985, when he became assistant deputy chief of staff for plans and operations, Air Force headquarters. After completing his tour of duty in the Pentagon, the general was assigned as deputy commander in chief, U.S. Southern Command, Quarry Heights, Panama. He came back to Air Force headquarters in August 1989 as assistant deputy chief of staff, programs and resources, and in March 1991 became director of manpower and organization. He assumed his present position in August 1991. The general is a command pilot with more than 5,500 flying hours, including 200 combat missions over Laos, North Vietnam and South Vietnam. Fighter aircraft he has flown include the F-4, F-15, F-16, F-51 and F-84. His military awards and decorations include the Defense Distinguished Service Medal, Distinguished Service Medal, Legion of Merit with oak leaf cluster, Distinguished Flying Cross, Bronze Star Medal, Defense Meritorious Service Medal, Meritorious Service Medal and Air Medal with nine oak leaf clusters. He was promoted to Lieutenant General Aug. 2, 1991, with same date of rank.